That’s the title of a conference that will take place tomorrow at the Canadian Museum of Civilization in Gatineau, Quebec. 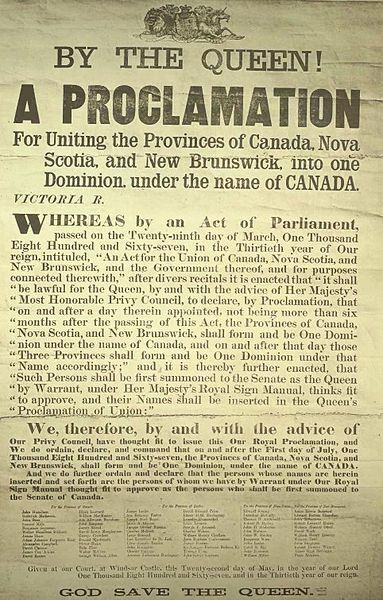 Participants will discuss how the 150th anniversary of Confederation will be celebrated in 2017. (The centennial of Confederation in 1867 was marked with civic projects across the country and a world’s fair in Montreal). I’ve pasted the program below. The curious thing is that while a few of the participants are historians, none of them are experts on Confederation! (Chad Gaffield is a social historian, as is Margaret Conrad). The 1960s saw a flurry of publications about Confederation. Many of these authors are now either deceased or retired. However, Peter Waite is still an active scholar, although his research interests have moved to more recent periods of Canadian history. I certainly hope that the organizers of tomorrow’s conference at least invited Professor Waite. Ged Martin is the author of several important works on Confederation. He is very much alive and well and has just published a new biography of Sir John A. Macdonald. I simply cannot understand why the organizers of this conference did not invite him. His omission from the program is astonishing, as is that of Christopher Moore. (I don’t know whether they invited Moore). I’ve published on Confederation and can assure you I wasn’t contacted. See: W.L. Morton, The Critical Years: the Union of British North America, 1857-1873 (Toronto: McClelland and Stewart, 1964); Donald Creighton, The Road to Confederation: the Emergence of Canada, 1863-1867 (Toronto: Macmillan, 1964); P.B. Waite, The Life and Times of Confederation (Toronto: University of Toronto Press, 1962). Nope, wasn’t invited (since you ask). But it seems pretty clear this meeting is for people who organize stuff about history, more than for people who do history (plus some who do both) Of the two categories, I’m okay being in the latter more than the former. People who organize heritage events should be in dialogue with working historians. It’s dangerous if they aren’t. For one thing, you can end up with heritage organization disseminating an outdated or otherwise inaccurate version of history. Moreover, engaging with the heritage community can keep historians, especially academics, grounded. I’m not saying that the projects that emerge out of this conference will disseminate any inaccurate information, but the lack of dialogue here is disconcerting. Well, yes, you are right, Andrew. But you know how boring these kinds of meeting are….. I would like to see historians of all ages being considered worthwhile guests. (Peter Waite, for what it’s worth, is very elderly, having retired decades ago – he’d retired before I started university at Dal! – and has been very ill for some time.) There is a strong tendency (from the CBC to the CMC) to think of only the usual suspects, based on recognizability (and “looks-like-an-historian” seniority) rather than newer and more diverse talent and perspectives. Reputation and past publications are good, but not everything. Plus, Christopher Moore is right – this looks more like people who speak about how their organizations promote history. That’s why the Canadian Studies Network was created, for example, from the ACS. Hi Claire, There are younger scholars they could have invited. Brad Miller, who is just about to take up his first tenure-track appointment at UBC hasn’t published on Confederation per se, but his research is on Canadian legal history in the Confederation era. Certainly he should have been invited. I repeat what I said in my reply to CM, working historians and the heritage community ought to be in continuous dialogue.